Cleft chestnut uprights spaced evenly apart and held in position by 2 or 3 twisted wire strands. Normally purchased in roles 30ft long in a range of heights 3ft – 6ft height but can be made to clients specification. 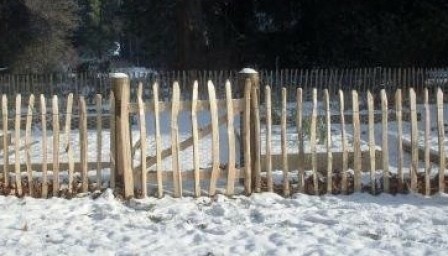 Chestnut paling is easy to move and fit to chestnut or oak posts and is often used as a temporary fence to enclose areas or prevent access but it can also be used as more permanent fence often with post and rail fencing when a higher level of security or animal enclosure is needed. Chestnut paling will last over many decades without treatment due to the high tannin content of the wood.